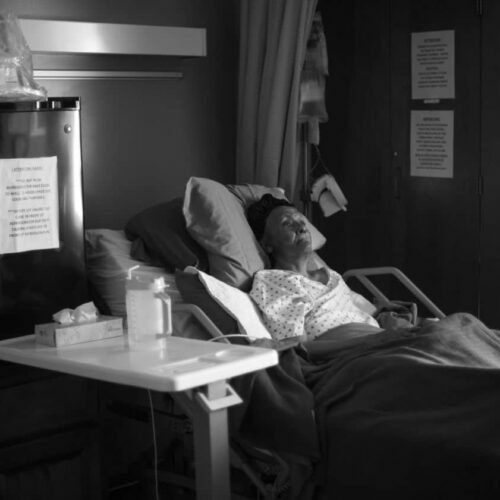 Edna Irvin lies in her bed at the Arkansas Health Center in Benton, Arkansas. A Center for Public Integrity analysis of more than 10,000 nursing homes across the country found that Arkansas was one of two states where the daily level of registered nurse care listed on public website Nursing Home Compare was at least twice the level the Center calculated than an analysis of annual financial cost reports. The Arkansas Health Center was not included in the analysis. More than 80 percent of nursing homes are reporting higher levels of registered nurse care to a government-run website for consumers than are reflected in their reports to Medicare. Studies show that the amount of care, especially by registered nurses, is strongly connected to the quality of care. Eight of the 10 states with the largest levels of reporting discrepancies are in the South. The Centers for Medicare and Medicaid Services was supposed to start using more accurate data for nursing home staffing reports by March 2012 — that hasn’t happened, and might not for another two years. A photograph of Edna Irvin stands in her room at the Arkansas Health Center in Benton, Arkansas. Irvin was first placed in a different nursing home after a family friend found her lying on the floor of her own home in Magnolia, Arkansas in January 2012. Edna Irvin enjoyed caring for other people so much that, even while she was in the grips of dementia and confined to a wheelchair, she’d wheel over to try to help other residents in the Chenal Heights Health and Rehabilitation Center in Little Rock. Irvin had been placed there by Lisa Sanders, her youngest daughter, after a family friend found the then-80-year-old lying on the floor of her home in Magnolia, Arkansas, on January 18, 2012. Irvin, a former certified nursing assistant who won awards for perfect attendance, had been lying there overnight. Sanders agreed with her mother’s doctor that Irvin could no longer take care of herself. She decided to move her mother to Little Rock and, after a couple of months, into the Chenal Heights home. The daughter assumed that the staffing levels and care her mother was to receive there would match the neighborhood’s attractiveness. After just one week Irvin was hospitalized for a bowel obstruction. Sanders said she arrived at the home to find her mother sitting in her own feces. The nursing home, which has since been renamed as part of an ownership change, declined to comment. On the public website where facilities post their daily staffing levels, Chenal Heights said it provided .19 hours, or about 11 minutes, of registered nurse care each day for its residents in 2012. But harder-to-find federal financial documents examined by the Center for Public Integrity reported average daily staffing levels at the home that were lower. Nursing homes across the country had similar reporting discrepancies between the two sources, the Center’s analysis reveals. Data on the publicly available Nursing Home Compare website, which is promoted and operated by the government for comparison shopping, reflects staffing levels self-reported by nursing homes during a two-week period before annual federal inspections. Advocates say many homes work hard to prepare for those visits. As a result, critics say, those staffing levels may be artificially inflated. The Centers for Medicare and Medicaid Services (CMS), the federal agency responsible for overseeing nursing homes, has talked repeatedly since 2001 about the inaccuracy of self-reported data. The self-reported staffing levels are also a crucial metric in the federal government’s broader quality rating of nursing homes on the Compare website, from one star to five stars. In 2005 the agency said the cost reports made annually to the state-federal Medicaid program are a more accurate source of information than Nursing Home Compare. Those financial documents, which are harder for the public to locate and analyze, contain data about the home’s revenues, expenditures and resident population during the year. Similar cost reports made to the federal Medicare program were analyzed by the Center; those reports showed daily staffing levels that were lower in thousands of cases. The discrepancies in reporting means that family members like Sanders believe their loved ones are receiving one level of care, when they may be receiving less of it. The reporting differences occurred for all types of positions, but were particularly high for registered nurses, the most skilled and highest paid workers. More than 80 percent of the facilities reported higher registered nurse staffing levels on the public Compare website than those the Center calculated through the cost reports. In more than 25 percent of nursing homes nationwide, the listed amount on Compare was at least double the level in the cost reports. Close to 100 peer-reviewed, academic studies have shown that the amount of care, particularly that provided by registered nurses, is most strongly connected with residents’ quality of care. Lower levels of care are associated with a higher likelihood of injury and even death. Although reporting gaps existed in nearly every state, they were greatest in the South. Eight of the 10 states with the largest reported levels of registered nurse discrepancies were southern. Among them: Louisiana and Arkansas, two states where the average self-reported levels were at least twice the amount calculated through the cost reports analysis. Baton Rouge and Memphis stood out among cities with at least 10 nursing homes. Dr. David Gifford, senior vice president of quality and regulatory affairs for the American Health Care Association, the nursing home industry’s largest professional organization, said he is “not surprised by these findings since the way cost reports collect information on staffing is different than [Compare’s one to five star system. ]” He added in a statement that daily direct-care nursing hours have increased for residents at all levels of nursing staff from 2008 to 2013. But Robyn Grant, director of public policy for the Washington, D.C.-based advocacy group the National Consumer Voice for Quality Long-Term Care, said the results were shocking. “We all recognize the data is flawed, but I am truly stunned by [the] findings and appalled that you’re finding this level of overreporting,” Grant said. Under the law, a transition to the more accurate payroll method was supposed to occur by March 2012 under CMS’ supervision. But it hasn’t happened yet — and may not for another two years. The agency said in a statement that recent legislation gives it the necessary, multi-year funding to complete the required process. Meanwhile, hundreds of homes throughout the country are also below minimum state staffing standards, according to the Center’s analysis. State inspectors are contracted by CMS to conduct onsite inspections about once each year to determine whether its nursing homes meet minimum Medicare and Medicaid quality and performance standards. Opinion is divided about the extent to which facilities know the precise dates of surveyor visits and inflate staffing levels in anticipation of those arrivals. Although a report in the early part of last decade prepared for CMS did not find evidence of systematic “staffing up” in advance of the surveyor visits, a 2007 academic paper found significant levels of over-reporting in Texas nursing homes that could suggest preparing for inspectors’ visits by raising staffing levels did indeed take place. But there was little ambiguity in an internal communication sent by Administrator David Fielding of Medford Multicare Center for Living in Medford, New York. Survey. All hands on deck during survey. It’s our super bowl and only lasts one week. The staffing hours will be a little high this week but will drop the following week. Klein responded by calling the amount of overtime “ridiculous,” the complaint said. The two men are among the owners, workers and administrators charged in a suit, still pending, that alleges widespread physical and financial abuse at the Medford home. Fielding’s lawyer Brian Griffin, said Fielding pled not guilty and is adamant that he violated neither criminal nor civil statutes. In a statement, Medford Multicare ownership asserted its commitment to “delivering exceptional care while maintaining fiscal responsibility,” and asserted that it consistently provided hundred of overtime hours of care per week. Edward Mortimore, technical director of the survey and certification group within CMS, suggested that the registered nurse over-reporting could be explained in part by the inclusion in the Nursing Home Compare data of nursing staff like directors of nursing who do not provide direct care. Mortimore also said that Compare’s two-week snapshot might not give as accurate information as an average daily basis. The Center for Public Integrity performed its analysis using a second data set with quarterly staffing information that only included nurses providing direct care. The findings remained nearly identical. More than 80 percent of the facilities self-reported higher registered-nurse staffing levels than those calculated through the cost reports, and in 26 percent the level was at least double the cost reports level. Advocates say this gap is critical to resolve as it is occurring at a time when the nation is bracing for a “silver tsunami,” as baby boomers reach senior citizen status. The number of standard state nursing home inspections dropped each year from 2008 to 2012, falling 6 percent from more than 15,700 to more than 14,700 during those years, the Center’s analysis of federal data found. The number of nursing homes fell just 1 percent during those years. The lower number of inspections only heightens the importance of accurate information, says Richard Mollot, executive director of the New York advocacy group the Long Term Care Community Coalition. “The data are entirely unreliable,” he said. Edna Irvin in her bed at the Arkansas Health Center in Benton, Arkansas. Sanders said the care her mother received at Chenal Heights was completely unreliable when she returned to the facility in late April 2012 after a month-long stay at St. Vincent Hospital in Little Rock. On May 3, Sanders learned that her mother had fallen from her wheelchair after leaning forward to pick up something off of the floor. She sustained an inch-long laceration to her forehead. On May 10, a nurse wrote that Irvin had a urinary tract infection. Registered nurse Lynette Smith wrote in a report that Escherichia coli bacteria were “in the normal flora of the intestine indicating she did not receive appropriate peri [perineal] care and/or Foley catheter care.” Smith gathered the documents on behalf of a law firm hired by Sanders to assist in her lawsuit against the Chenal Heights facility. Irvin had a second fall on May 16. This time, she was found leaning forward out of her wheelchair to pick up some crackers off of the floor. A knot the size of a plum grew on her forehead. By the end of the month, when her mother was complaining of abdominal pain, Sanders concluded that she would not readmit her mother to the nursing home after her release from the hospital. “When she went in the hospital on May 31, 2012, I had already made up my mind that I was going to move her,” she said. Lisa Sanders helped organize family members of residents at Sandalwood Healthcare when her mother, Edna Irvin, was a resident at the facility. In September 2014 Sanders filed suit against Sandalwood, alleging that her mother received substandard care there. Sean Mathis, a lawyer for the company that owns Sandalwood, said the home will “vigorously defend itself”. Sanders’ decision came just two months after the Affordable Care Act required that nursing homes transition from the self-reported staffing method to a payroll-based method. The ACA mandated that CMS implement by March 2012 an electronic data collection system by which facilities would submit payroll-based, verifiable staffing information about registered nurses, licensed practical nurses and certified nursing assistants. Information about the amount of staffing by position and staff turnover was to be published on Nursing Home Compare. But on December 9, 2011, Thomas Hamilton, director of the agency’s survey and certification group, informed state officials that CMS would not make that deadline due to fiscal constraints. Little progress has been made since. Mortimore of CMS said the agency designed a pilot program it hoped would test on 1,000 homes. In the meantime, hundreds of nursing homes have had staffing levels that are lower than those mandated by state laws. Thirty three states and Washington, D.C. had mandatory daily direct care staffing requirements that in 2010 ranged from .44 hours per resident in Arizona to 3.9 hours per resident in Florida, according to a survey conducted by Charlene Harrington, professor emeritus of nursing at the University of California, San Francisco. In 2012 more than 700 facilities, including more than 250 nursing homes in Illinois, had daily care levels that were lower than the levels required by the states, after applying the cost report analysis. Harrington said the sub-standard staffing levels revealed a related oversight failure on the state and federal levels. “It’s just another symptom of not doing the oversight that they’re supposed to be doing at the state level,” Harrington said. “CMS should demand that the states should look at it because the very first tenet of being certified is that facilities meet state law. “If they haven’t met state law, CMS shouldn’t be certifying them,” Harrington said. The Center contacted CMS repeatedly, but the agency declined to comment because it had not seen the Center’s analysis. Rain falls outside the entrance to Sandalwood Healthcare, a nursing home in Little Rock, Arkansas. In 2012 Sandalwood had an average registered nurse staffing level of 10 minutes per day, according to public website Nursing Home Compare, but the Center’s analysis said it was lower than that. Sean Mathis, a lawyer for the company that owns Sandalwood, asserted that in 2013 the Arkansas Office of Long Term Care found that the nursing home was only short staffed for two of nearly 1,100 shifts. Irvin’s problems continued after Sanders moved her from the Chenal Heights facility to the Sandalwood Healthcare nursing home in Little Rock in July 2012. Ultimately, Sanders filed suit against Sandalwood in late September 2014, alleging that her mother received substandard care there. In the suit, Sanders asserted that her mother endured dehydration, blood clots in both legs and malnutrition. Sanders attributed these problems in large part to the facility’s meager staffing levels. Sandalwood had a listed registered nurse time of .17 hours, or 10 minutes, per day. But the Center’s analysis showed it was even lower than that, and in 2014 the state of Arkansas sanctioned the facility for its lack of staffing. Sean Mathis, a lawyer for Hope Healthcare, the firm that owns Sandalwood, said Sandalwood will “vigorously defend itself.” He said Sanders’ suit against Sandalwood was similar to the Chenal Heights suit, and wondered why Sanders kept her mother at Sandalwood if she was unhappy with the care. And he asserted that in 2013 the Arkansas Office of Long Term Care found that the nursing home was only short staffed for two of nearly 1,100 shifts. The office said that inclement weather kept Sandalwood from achieving a perfect record, according to Mathis. Irvin is now under her daughter’s watchful care at the Arkansas Health Center in Benton, Arkansas. Meanwhile, the mandated transition to reporting from payroll data —and more accurate reporting of staffing levels — remains incomplete. In October, CMS said it would complete the implementation of the payroll system by the end of 2016 after bipartisan legislation authorized $11 million in funding. Sen. Charles Grassley, R-Iowa, and Schakowsky, two of the leading figures in pushing for the transparency clause in the Affordable Care Act, expressed disappointment at the agency’s failure to complete its mandated task. For her part, Grant of the National Consumer Voice called the implementation of the payroll data collection system “long overdue”. Although pleased with the funding from Congress and CMS’ stated timeframe, she said her organization would remain vigilant. “We will continue our advocacy to ensure the system is implemented appropriately and within the stated time frame,” Grant said. Lisa Creamer contributed to this story. This story was written with support from the Fund for Investigative Journalism.